The men’s track squad split in half to attend two dif­ferent meets this past weekend. One part of the team headed to Grand Valley State for the Al Owens Classic, while the other half headed to sunny Cal­i­fornia for the Mt. SAC Relays. Head coach Andrew Towne said the team per­formed well at both meets. The Al Owens Classic saw ath­letes improving and readying them­selves for the upcoming meets. There’s just one more meet before Hillsdale hosts the G-MAC Outdoor Cham­pi­onships. Senior captain Nathan Jones said the team has to be able to balance the busyness of the end of the semester. Senior Seth Overla said the team is putting in the work to be ready for the end of the season. The team is home for the rest of the season, besides the NCAA Cham­pi­onships. 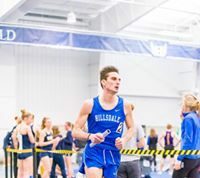 This weekend, Hillsdale will host the 52nd Annual Hillsdale College Gina Relays.